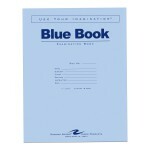 • 8 Page blue book. • Qty (3) Blue Books required for MATH 103. (Please enter quantity wanted in Qty field). • SOC 110 - Qty 3 - Required. • SWK 256 - Qty 3 - Required.